When thinking about the best woods for picture frames, maple needs to be considered. It has some very unique qualities that make for great looking frames. It has pleasing grain patters and is a very hard and durable wood. It's not easy to accidentally dent or ding a piece of maple in the shop as it is with fellow hardwood (which is actually very soft on the surface) poplar. Maple also comes in some stunning flavors like birds-eye and curly. Birds-eye maple is very often used in decorative applications like trim, inlays, and even the interior consoles and doors of cars. You'll probably recognize curly maple (also called tiger maple or fiddle back) as the body of many gorgeous guitars. 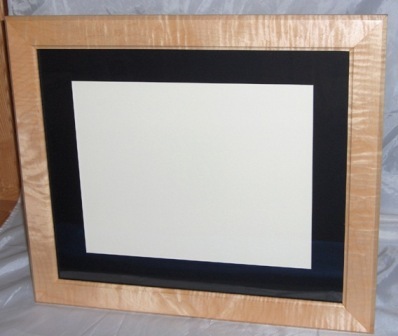 The frame to the right is made of curly maple and simply finished with a satin top coat. Notice the "tiger stripes" and glowing top and bottom rails. As shown, you can certainly make some really nice picture frames with it. With that said, it's not all fun and games. While maple makes the list, it certainly has some issues. Over the years I've found maple to be more challenging to stain than the other woods I typically work with. Maple is similar to cherry in that it blotches quite a bit, even more than cherry. Like cherry though, you can really use the blotching to your advantage, which many people do! Most of the maple I have come across has some level of shimmer or glow to it. 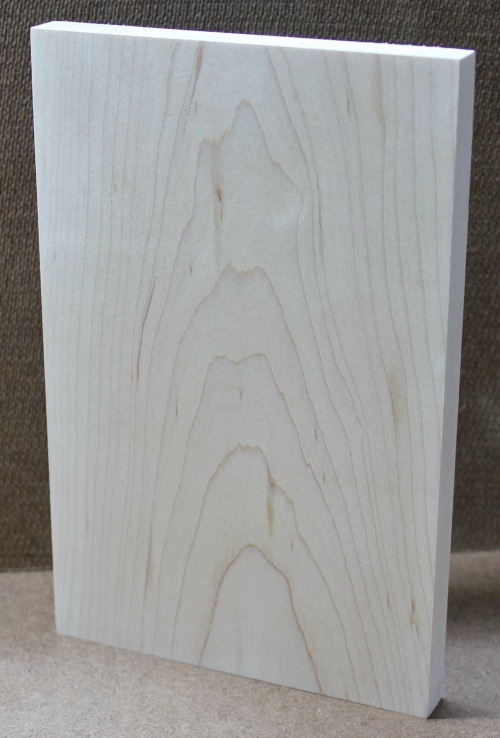 Curly maple is loaded with it - in fact the name "curly" hints at it. Also, like cherry, you can see it plainly in the wood long before you get to the staining phase of making your frames. 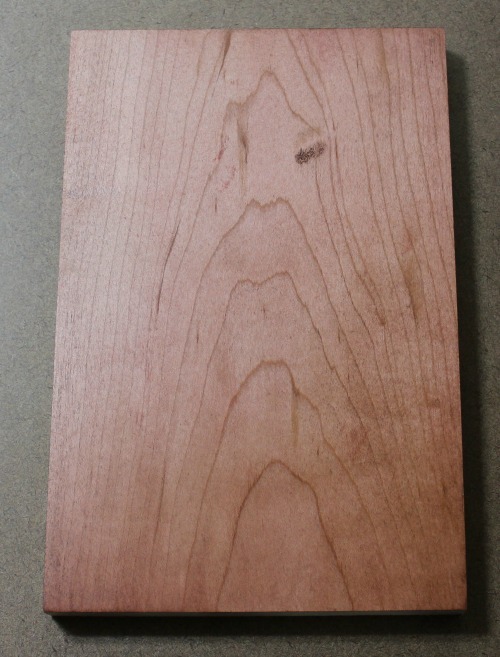 Maple is not as porous as cherry and can be more difficult to get a "deep" color. Gel stains, because of their thick consistency, don't penetrate the wood as well and just wipe right off which leads to applying more coats. Liquid stain fairs better, but still take more coats and effort (which can be well worth it - don't get me wrong!). Using a top coat only does produce amazing results with maple, especially if there is a lot of "curl" in the wood. You can produce amazing waterfall and 3-D effects, like the frame in this picture. Maple is not only on my list of the best woods for picture frames - its on the list of most beautifu woods for guitars. Guitar makers have made maple famous. It's almost a standard for guitar players. By using different color dye stains that enhance the curl they can create unbelievably beautiful pieces of "art". Dye stains can be quite effective on maple and are something worth experimenting with. They sink below the surface and really highlight the figure of the wood. They also come in many colors such as the famous sunburst orange that is seen on so many guitars. 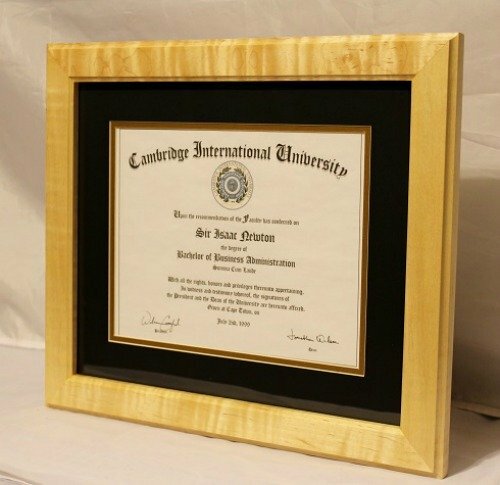 Making the list of best woods for picture frames, means there are positives to enjoy. Well, there are many positives to using maple, but there are still some more negatives to cover. I already mentioned some of the challenges with staining. A bigger challenge though is machining maple. It's more difficult to rip on a table saw, tears and chips often while routing and, if it has a lot of figure, running it through a planer and jointer can result in a pock-marked board. The issue I've experienced with ripping maple is that it has a tendency to "close back up" as you cut it. A riving knife or splitter is essential (you should always use the blade guard and riving knife that came with your saw anyway). Even with the splitter in place, which helps to prevent kick-back, the board may be hard to move through the blade. It can close up on the splitter and pinch it tight enough that you can't push it forward. If this happens to you - DO NOT FORCE IT or try to back the board out. Carefully shut off your saw, otherwise you run the risk of kick back and injury. Unless your blades and cutters are VERY sharp, the chances of getting burn marks on the wood are high also. With maple, you really have to take your time, make shallow cuts with the router and planer and set aside more time than usual for the staining and finishing process. Maple requires more work, for sure, but it also can produce beautiful frames. Maple is a little bit easier to get than some of the other hard woods. Some of the big box stores still offer it. If your local big box store doesn't stock it, you can find it at any lumber yard or wood working store in your area. The price is fairly cheap - more expensive than pine or poplar - but less than cherry, walnut and mahogany. Specialty maple though, like bird's-eye and curly, are more difficult to find and cost more. Lumber yards in your area may have it, but you might have to go on-line to find it. If you're creative and up for experimenting, find some curly maple and see what you can come up with and I'm sure you'll agree it belongs on the list of best woods for picture frames. Have a question or a comment? This space is for you! Leave it in the box below.